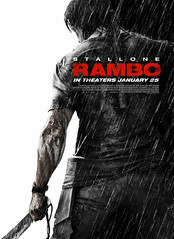 Sixty-one years old, but looking as tough as a truck-stop steak, Sylvester Stallone shouts and shoots a fifty-caliber cannon, converting Christian-oppressing pirates and perverts into pulp, parts, and puddles, before they can mutilate and murder the missionaries and mercenaries trying to bring light to a lifeless land. Standing atop the mountainside of meat, bone and bullet shells, Stallone sighs, looking like a leathery god as actress Julie Benz gapes upward in awe. There is no titillating tension in the post-traumatic exchange, but rather the look of a lost lady who has finally found a father figure to fend off our foes in this woeful world. It’s been over a quarter of a century since John Rambo drew First Blood, and he’s not the only comfort figure from the 80s that has come back much like a father. In fact, Stallone was back in 2006 as Rocky Balboa, dealing with issues of aging, death, redemption and reconciliation with his son, played by Heroes‘ star Milo Ventimiglia. 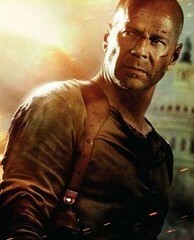 Additionally last year, Bruce Willis reclaimed the familiar role of John McClane, but instead of rescuing his wife, he returned as a father to liberate a captive daughter, dear daddy determined to let his little girl Live Free and make his enemies Die Hard. Another father featured on the return circuit was the robotic Optimus Prime, daddy to latchkey kids through afternoon animation with programmed parenting that made even Wired Magazine comment. 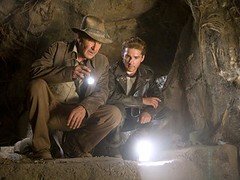 To bring things full circle from summer 2007 to summer 2008, Transformers star Shia LeBeouf will play son to another returning 80s daddy in this summer’s prime contender for top box office, Indiana Jones and the Kingdom of the Crystal Skull. The intrepid ark-finding adventurer will uncover a biological find, and likely embark as a deadbeat dad on an upbeat escapade. Is Hollywood having a love affair with Dad? It seems so, and it may have started when Superman Returned in 2006 to discover his little Kryptonian spawn with Lois. Fascination with dad seems sometimes to feature tension and a need for reconciliation, but ultimately looks to a father figure to provide a sense of hope and victory against overwhelming odds… to know that Dad is never far away, watching over us with protection, provision and love. Even when it’s not a literal dad in the narrative, it’s a dynamic, familiar hero figure from the 80s coming back decades later like a dad – or grandpa – offering the courage and stability of a “simpler” time… something and someone we can count on. If you believe statistics, as high as 40% of children are heading to bed each night without their dad in the same house. Between unwed mothers, divorce – and admittedly, tragic death in some cases – boys (and girls) don’t have the model of father impressed in their lives. Worse yet, many dads are simply wretched models of provider, comforter, role-model, or any kind of inspiration. This is part of what made the testosterone fueled Fight Club (the adaptation of Chuck Palahniuk’s novel) popular in 1999. With so many 30-year olds today finding themselves unmarried, uncertain about their role and future, and living in a state of prolonged adolescence, it’s no wonder Hollywood is capitalizing in on this felt need. Who would have thought we’d be jonesing for Indiana Jones, or dying for the Reaganomic regulators of the 80s? To me, it’s evident that we’re grasping at straw men in lieu of the Father we truly need. My dad passed away in 2005. He was a godly man who tried to model God AS a father, to be a little mirror of our Creator. Perfect? No. Earnest. Yep, and I miss the guy a lot. Other guys I know never had the luxury of an earthly model, or even worse – they had one they wish they could forget. It’s not a “new” thing that men and women are yearning for a father figure. Hollywood is just catching on and cashing in on the latest crop of retro-daddies. Still, these movies aren’t necessarily a bad thing, so long as we recognize that it’s not really a DAD-shaped hole we’re trying to fill. The warm place these father figures hold should make us recognize what we truly need.